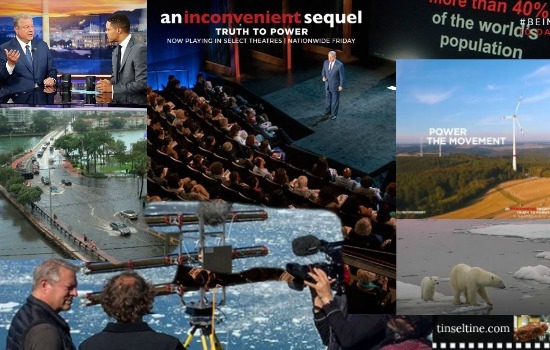 A decade after An Inconvenient Truth brought climate change into the heart of popular culture, comes An Inconvenient Sequel: Truth to Power, which isn't so much about climate change as it is about inspiring people to change their approach to climate change. Of course, we are still brought into the doc with an opening sequence taking place where we all associate the word "global warming" - The North Pole, where we see Al Gore flying over ice fields in a helicopter, with glaciers literally popping from rising temperatures. While the original "Inconvenient" was largely a dramatized re-creation of Gore's traveling scientific slideshow, the new film is a classic cinéma vérité production, with the filmmakers, Bonni Cohen and Jon Shenk shadowing Gore for months - at sites that show the dimensions of the challenges, particularly Miami Beach, which has seen tremendous flooding in the last few years due to rising tides. We see him in Greenland, interviewing science researchers and observing the meltdown of rapidly collapsing glaciers, in training classes speaking to grass roots climate activists. We see him go to Paris, during the global climate conference before the Paris accord, terribly coinciding with the terrorist attack in the city. And we see him travel to a small-town in Texas in the reddest part of this red state, where surprise, surprise, the conservative mayor is committed to using nearly 100% renewable energy sources. Not because he's a raving environmentalist, but because he's found it's cost effective to his constituents. If "Inconvenient Truth" felt groundbreaking, the sequel comes on the heels of a wave of documentary films exploring aspects of the topic, from Fisher Stevens & Leonardo DiCaprio's "BEFORE THE FLOOD" to the recent Netflix project "Chasing Coral," about disappearing ocean reefs. But as Gore puts it, "following climate news has become like a nature hike through the Book of Revelation.” so perhaps there can't be too much emphasis. Particularly, in light of Trump's villainous decision to pull out of the Paris Agreement. Which definitely gives An Inconvenient Sequel the perfect antagonist and makes the doc very timely. Bottom Line: The first few scenes of An Inconvenient Sequel:Truth to Power had me thinking, the melting of the glaciers has its own beauty, perhaps the earth's intention is to adapt to new temperatures, that change is inevitable, even when it comes to glaciers. I think there's some truth to this, but that doesn't mean the earth will adapt to accommodate its inhabitants. And really, hasn't it always made sense to use the energy sources of the sun and wind? I was very impressed with Al Gore's impassioned speech near the end. I don't know if he wrote it, but he certainly delivered it with just the right amount of passion, wisdom, integrity and hope. Further making Trump look like the greedy, unenlightened, buffoon he seems to be. I just wish Gore could have been this charismatic running for President.